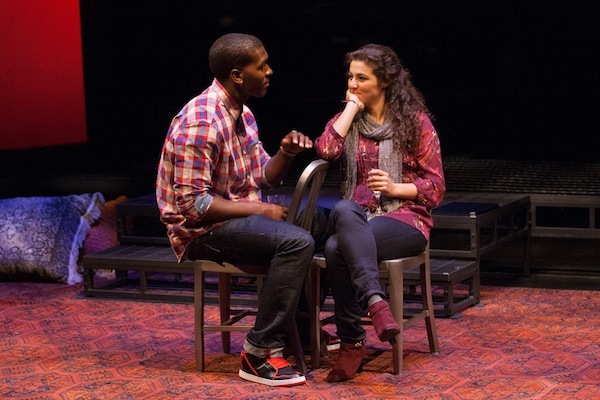 Khris Davis and Melis Aker in Love in Afghanistan at Arena Stage. Photo credit: Teresa Wood. It could have been the perfect modern-day Cinderella story—rich and handsome boy meets oppressed but beautiful girl, the attraction is immediate, they fall in love, and despite the multiple barriers that ensue, he eventually rescues her from her oppressive situation, they get married and live happily ever after in his world of fame and fortune, never to look back on her former life of injustices. Real life and love, of course, are much more complicated, and thankfully, the lovers’ relationship in Arena Stage’s production of Love in Afghanistan reflects life and love’s complexities. It doesn’t fall prey to the fairy tale ending. Playwright Charles Randolph-Wright’s modern tale of love in war-torn Afghanistan is the story of Duke (played by Khris Davis), a young, successful American hip-hop artist performing for the US troops at the military base in Kabul, whose language interpreter, Roya (Melis Aker), is a beautiful and smart Afghan woman who, when she’s not utilizing her skills as a polyglot for the US military, is secretly helping run an underground rescue organization for women. Intrigued and impressed by the other person, an immediate and intimate friendship between Duke and Roya develops. Although the transition from friendship to love is predictable, the relationship between the two characters is not. Theirs is a love complicated by the intricacies of two separate cultures that, in many ways, are not compatible with one another. He is from the ‘land of the free and home of the brave’ where playing the proverbial hero on the white horse rescuing the damsel in distress is considered noble and romantic, while she is from a land where, although fear permeates every facet of life and bomb explosions are regular occurrences, women do not want to be rescued by men but, rather, are rescuing themselves from the oppression of a male-dominated society. Randolph-Wright has written an extremely compelling story which explores the notion that love does not necessarily mean building a life together, but does mean that individual life can be built together. He gracefully creates a hopeful ending without selling out to the Hollywood ideal of “happily ever after,” sculpting interesting and sympathetic characters. Davis, as Duke, perfectly captures the essence of young ego, mixed with hidden uncertainties and doubts about himself and his future that emerge in beautiful moments of vulnerability. To watch him seamlessly transition from outer bravado to inner fear, while at the same time watching Akers’ transition from outer fear to inner strength was exciting. Akers puts in an amazing performance as well that was moving and powerful, not ever letting the audience feel sorry or afraid for her. Rounding out the cast were the fine talents of Joseph Kamal, whose portrayal as Sayeed, Roya’s father, was very caring and compassionate, and Dawn Ursula, as Duke’s mother, Desiree, whose impeccable comic timing provided for some of the most enjoyable moments of the show. Although there are only four actors present, there other characters in the show, specifically US military interrogators and a Afghan prison detainee, who were not seen or heard by the audience, but were seen by and spoken to by the ensemble. Although the quartet provided the audience clues as to what was supposedly said by these invisible characters, to see them interact with these non-entity beings emotionally pulled me out of the world of the play. Instead of feeling like I was a witness to the real lives of these four characters, I felt like I was an adjudicator in a monologue competition. While I understand the reason why these silent characters were not played by actual people, some of the writing and scripted responses to them seemed hackneyed and trite, unlike the rich dialogue found throughout the rest of the show, and which subsequently, was very distracting. Similarly, I was confused why, throughout the show, the actors not in the scene would occasionally remain on stage, but at other times, they would exit, leaving only the actors in that scene on stage. When they would remain, they were still and silent, but were sometimes facing the audience, at other times would turn their back to the audience, or once, were standing visible in the wings. Perhaps director Lucie Tiberghien had good reasons for choosing to keep all actors on stage and in certain positions during certain scenes, but I couldn’t figure out what those were. That being said, her directional navigation of Randolph-Wright’s compelling story with four extremely talented actors was impressive. To have the lead characters repeat the opening dialogue as the closing dialogue, but to have them swap positions on stage to show the evolution of their relationship, was very simple but extremely powerful, and a brilliant feat of writing by Randolph-Wright. The strength of Love in Afghanistan lies in that powerful simplicity. It’s a modern Cinderella love story. Minus Cinderella. Love in Afghanistan is in performance now through November 17, in the Arlene and Robert Kogod Cradle at Arena Stage, the Mead Center for American Theater, located at 1101 6th Street SW, Washington, DC 20024. Tickets $50-105. Closest Metro stop: Waterfront (Green line). For more information call 202-554-9066.